Blue Palm Villa is great for any group of travelers, family or friends. I love how spread out the bedrooms are, and how close the villa is to the beach. Plum Bay is a fairly secluded beach, so you can avoid crowds and enjoy the peace and quiet. 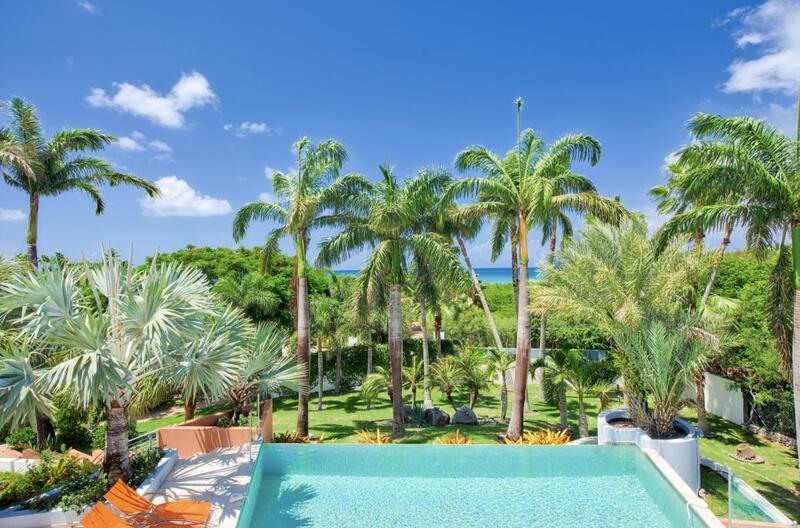 Blue Palm Villa is just steps away from Plum Bay, a white sand beach on the French side of St. Martin. It’s tucked into the private and gated enclave of Terres Basses. Blue Palm’s outdoor area includes a large infinity pool and expansive terrace with sunset ocean views over Plum Bay. The main living space opens off the terrace on the ground floor with a fully equipped, air-conditioned kitchen. The living area also has a separate air-conditioned TV room and study. The villa also has an air-conditioned gym, sauna, and tennis court. A panoramic terrace on the upper level offers a sea view. The master bedroom sits on the ground level with an ensuite bath, and overlooks the pool and sea views. The second bedroom is also on the ground level with an ensuite bath. Two more air-conditioned bedrooms with their own bathrooms are located on the lower level. The studio bedroom is in a separate building with its own living area, bathroom, and private terrace. Blue Palm villa is just a one minute walk from the beach and a 5 minute drive to shops and restaurants.